“A long time ago, among moutains far from any civilization, there was a center researching on human innovation. One day, the main computer of the research became malicious and went berserk. Humanity managed to stop this, and peace came back…or so it seemed. Humans, now in peace, predicting that their enemy could go berserk and attack another time, decided to build giant robots and machine, and trained chosen warriors to fight against it. Finally, this day has come. Wow, really convinced now that they’re starting to pull stuff from Power Rangers. Not that they haven’t before, but it’s just much more obvious this time around. Either that, or they’re really letting Koichi Sakamoto take the reigns on this one. Either way, let us reserve judgement until we’ve seen more. New Gobuster Rumors: Trust No One. Seriously, there’s no consitency with these rumors anymore..
Well, there’s been a number rumors about the future Sentai series Gobuster that have popped up over the last day or so, and I would have reported on them sooner, but I got swept up in the Power Ranger Morphenomenon Jungle Fury Marathon that’s still running on Nicktoons. Ignoring that, there is one thing I can say for certain about the rumors, and that is that I have no certainty about what the story is suppose to be anymore. There’s been one rumor after the next, and they all seem to contradict one another (for example, there’s one that was posted on JEFusion that says their suppose to be University students, but since it was proven false I’m not going to mention any of it). So for now, I’m just going to post rumors from solid, semi-reliable sources, which leads us to this batch of rumors from Dukemon22. It would seem to somewhat solidify the spy theme rumor that came out yesterday, and the general connection to Metal Heroes that’s been persisting since before the series name was even confirmed. Red’s motif/partner is a Cheetah. It can transform into a motorcycle. Blue’s motif/partner is a Gorilla. Main ability comes from raw strength. Yellow’s motif/partner is a Rabbit. Master of technology that can hack into any computer system. The forehead of the helmet has the face of the animal. The eyes of the helmet are sunglasses, similar to GokaiSilver in color. They look a little like Metal Heroes. There are Partner Robots. Cheetah and Gorilla are person sized, and will be of the rubber-suit variety while Rabbit will be Bomper-esque in size. And yes, they will supposedly act as the Sentai mechs and combine together to form the main robo. Why Robotack you ask? Because that’s probably the closest to what they’re describing. Hopefully, they’ll look a little better than that. Also rumored was their henshin devices and weapons: For the henshin device, supposedly they will be using sunglass to henshin. The sunglasses will pop out from their wrist bands/watches. And since they’ll be spies, their main wepins will by spying equipment (cameras, smart phones, etc.). And that’s all of it, for now anyway. Hopefully, we’ll start seeing more of a consistency with these rumors. BTW, how awesome is that Battle Fever fanart?! Author M.F. CalhounPosted on November 21, 2011 November 21, 2011 Categories MC's postsTags appearance, costume design, henshin device, mecha, partners, rumors, spy theme, theme, Tokumei Sentai Gobuster, weaponsLeave a comment on New Gobuster Rumors: Trust No One. Seriously, there’s no consitency with these rumors anymore..
A new set of rumors involving the Go-Kaiger Vs. Gavan movie and the next Sentai series Gobuster recently popped up, and they seem to point to a completely different story than what’s been previously rumored. So let’s get started! Zangyack controls the Space Police and Gavan arrests the Gokaiger for being pirates. The mysterious Gavan Bootleg shows up, arresting Gavan. Current rumors point say that Gavan Bootleg will be one of the main villains of the movie. And that’s what’s come out for the movie. Not much, but there you go. The Gobusters will start with Red (Male), Blue (Male) and Yellow (Female) it will move to 5. Additional members will be Black (Male) and Pink (Female). Red is rumored to be played Acaba Mio (Gokusen). A cheetah mecha was mentioned. Animal motifs, at least for the mecha, seem likely. The series is rumored to be a spy theme. Anyway, that’s it for Super Sentai-related news. If anything else pops up, I’ll let you know! Gobuster First Leaked Image? : Costume Designs can be tricky, but this one seems alright. Well, the first supposed leaked image from the next Super Sentai series, Tokumei Sentai Gobuster, is out now, and it depicts what may be the official costume design for the new team. Going over the design, it is an interesting one, to say the least. It seems to be partly based on the Boukenger costume, at least around the limbs. Not sure how I feel about the big yellow hexagon on his chest though. However, I do like that their trying to bring back the tech helmet look, since it really hasn’t been seen since Timeranger. At this point, they’re still probably working out the details with the design, but overall I like it. And there is a strong possibility that this could be related to the final design, especially considering that last year around this time a possible costume design for Go-Kaiger was leaked that was very similar to the final design. So you never know. Keep in mind though that this could very easily be a fake, or at least an alternate design they decided not to go with. I can say this though; it does fit the bounty hunter/Metal Hero rumors that have been floating around. Not sure where the yokai would fit into all this though. I can see them working together with Gavan and Sharivan very easily. Author M.F. 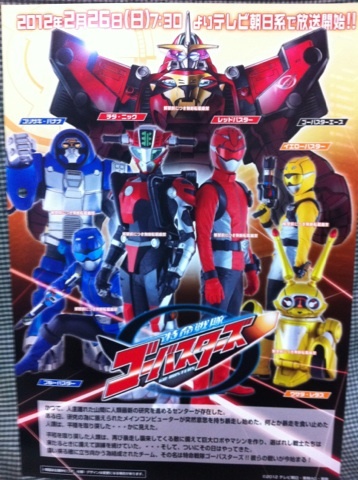 CalhounPosted on November 6, 2011 November 6, 2011 Categories MC's postsTags costume design, first, image, leak, rumors, Tokumei Sentai GobusterLeave a comment on Gobuster First Leaked Image? : Costume Designs can be tricky, but this one seems alright.